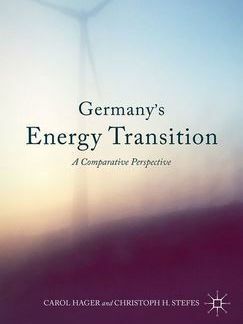 This book, edited by Professor Carol Hager, Ph.D. and Ecologic Institute's Associate Professor Christoph H. Stefes, Ph.D. analyzes Germany's path-breaking Energiewende, the country's transition from an energy system based on fossil and nuclear fuels to a sustainable energy system based on renewables. The authors explain Germany's commitment to a renewable energy transition on multiple levels of governance, from the local to the European, focusing on the sources of institutional change that made the transition possible. They then place the German case in international context through comparative case studies of energy transitions in the USA, China, and Japan. These chapters highlight the multifaceted challenges, and the enormous potential, in different paths to a sustainable energy future. Taken together, they tell the story of one of the most important political, economic, and social undertakings of our time. Hager, Carol and Christoph H. Stefes (eds.) 2016: Germany's Energy Transition. A Comparative Perspective. Palgrave Macmillan US: New York.